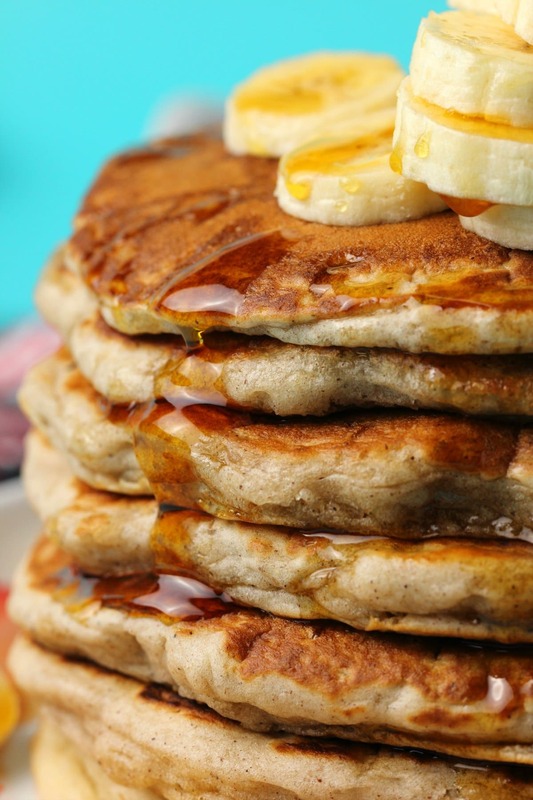 Vegan Banana Pancakes, Light and Fluffy! 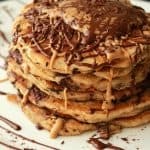 Easy vegan banana pancakes! 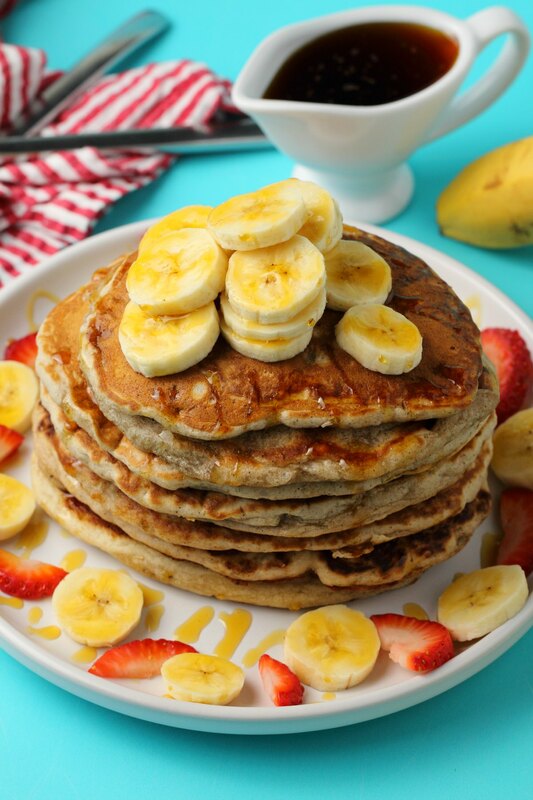 Perfect for a delicious vegan breakfast topped with sliced bananas and syrup. Light, fluffy and perfect. 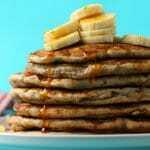 These vegan banana pancakes are light and fluffy with loads of banana flavor, and served with plenty of sliced banana and syrup they make a perfect breakfast treat. 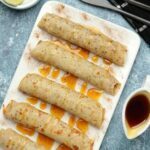 They’re also super easy to make, so they’re just perfect for a lazy Sunday morning. 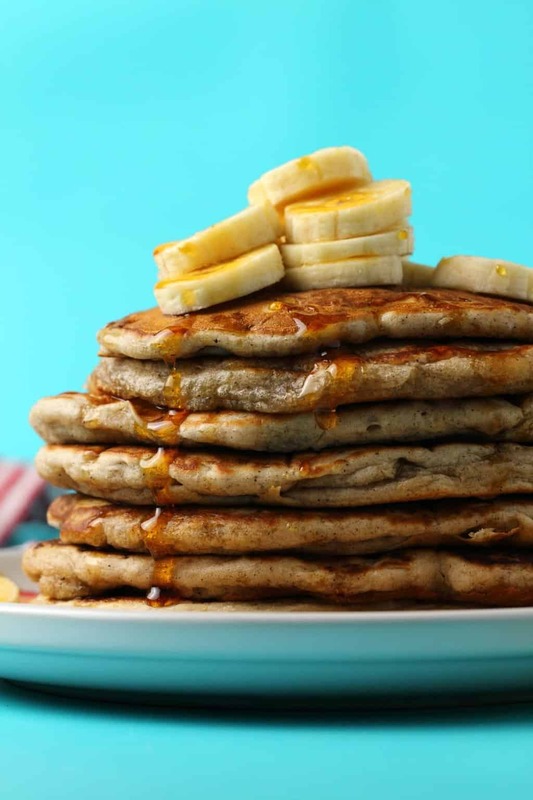 This recipe is adapted from our vegan pancakes recipe with a little inspo from our vegan banana waffles. The issue I kept running into when recipe testing was wanting to use too much banana in the batter. With my banana waffles recipe, I found that I had to cook them quite a long time, until very golden brown on the outside to get to the right level of cooked on the inside. Cooking these pancakes on a gas stove, they would have been burned on the outside before I got to the right texture on the inside. The flavor was great! But it was too wet inside. So I had to reduce the amount of banana until I used just one large banana in the batter. It’s not a lot, but it turned out to be just enough so that the pancakes have delicious banana flavor, but are still nice and light and fluffy inside, and not weighed down by too much banana. So making the batter is just a simple case of sifting some flour into a mixing bowl and adding a little sugar, baking powder, salt and cinnamon and mixing together. Then mash up some banana in a bowl with some coconut oil and add to the mixing bowl with some soy milk and vanilla extract and mix into a thick batter. 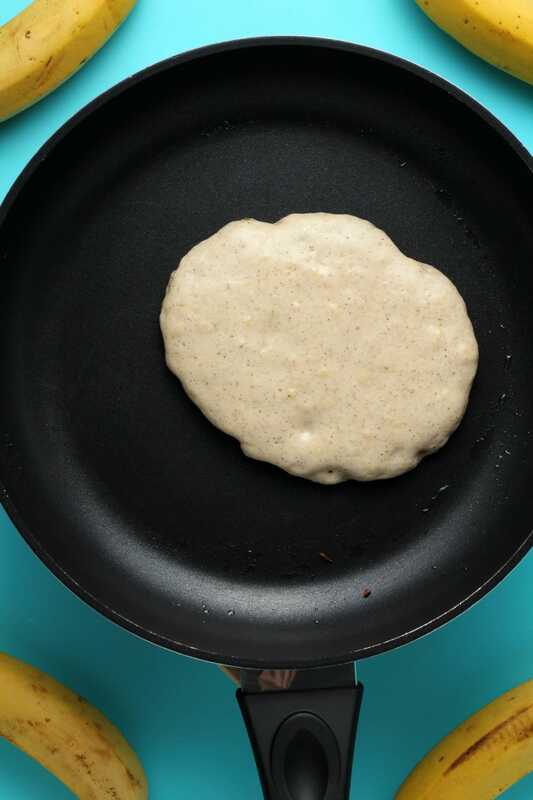 Heat up a pan with some coconut oil until hot and then add in around 1/4 cup of batter for your first pancake. 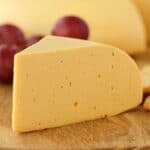 When it starts looking a little dry along the edges with little bubbles on top then it’s time to flip it and cook it on the other side until nicely browned. 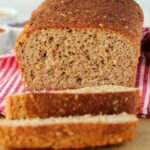 I have a little thing with banana recipes like our vegan banana bread and vegan banana cake and vegan banana bread muffins where instead of mashing the banana, I just blend it along with the other wet ingredients. 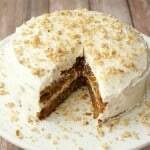 It enables you to have a very smooth batter with the banana very evenly dispersed. 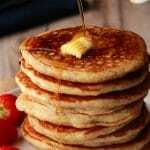 With these pancakes I tried it both ways, blended and mashed. It’s often easier to blend if you have a few bananas and coconut oil that you won’t have to melt first if you’re blending it all up. So in that respect it can make it a bit easier, but since this recipe only uses one banana and 1 tablespoon of coconut oil, you can also just mash it all up in a bowl. Your batter won’t be as smooth, but I didn’t notice a difference in the final result. Top Tip: Cook the pancakes long enough! 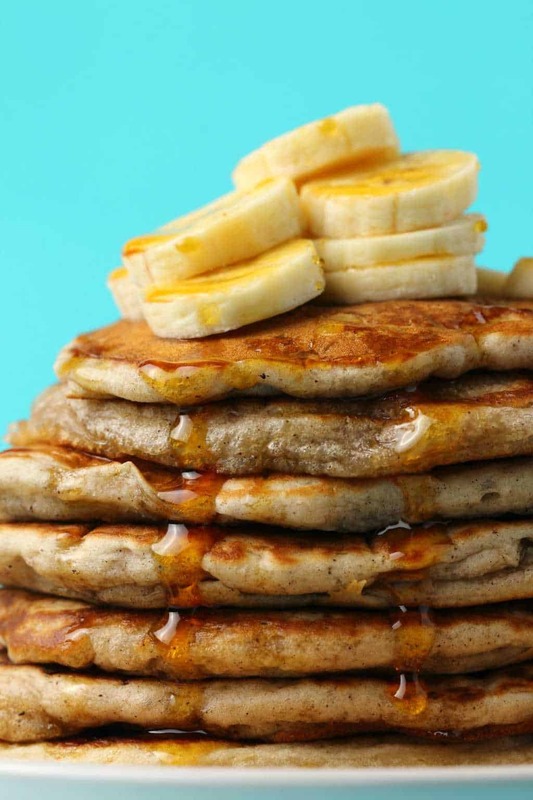 Even with the perfect amount of banana in these pancakes you do still have to cook them until very nicely browned on each side, flipping often, and pressing down with your spatula, so that they have time to get perfectly cooked on the inside. 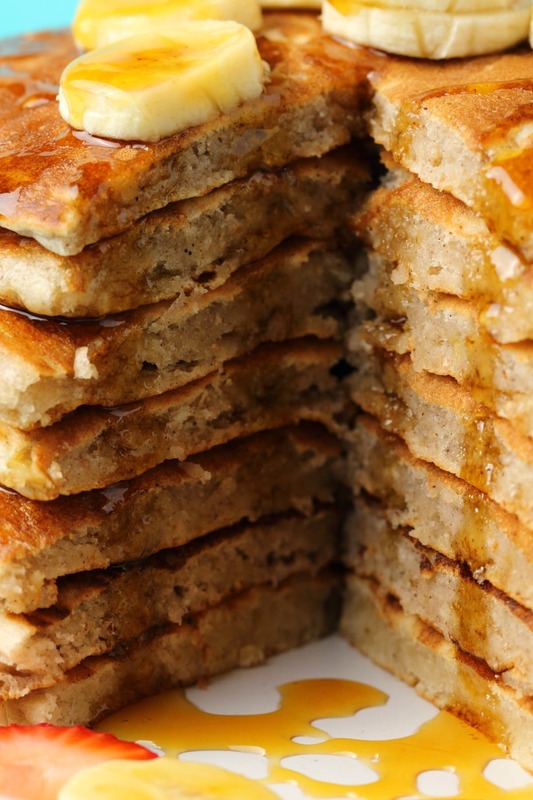 Serve topped with loads of sliced banana and drizzles of syrup! 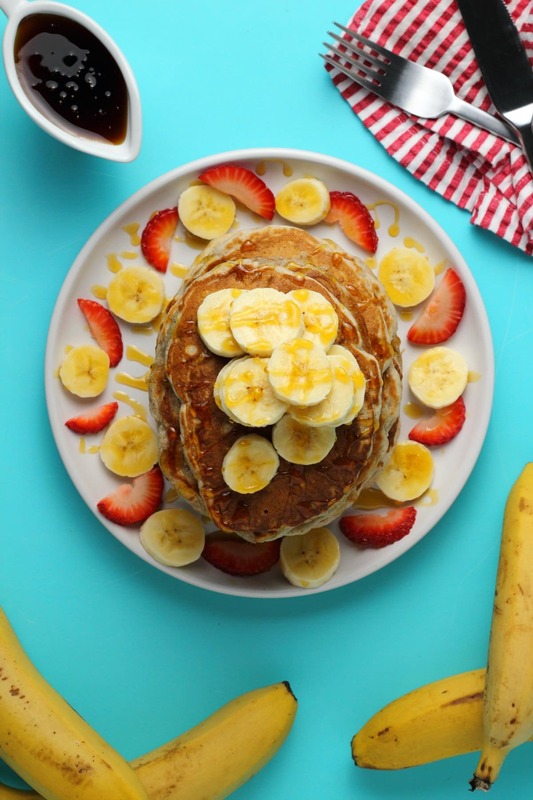 What do you think of these gorgeous vegan banana pancakes? I hope they’ll be on your Sunday breakfast menu soon! 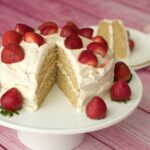 Post any questions in the comments below and please do rate the recipe too. Thanks so much. Sign up for our email list so that you can be the first to know when new recipes are published, and you’ll get an awesome (and free) dinner recipes ebook too! Sift the flour into a mixing bowl and add the sugar, baking powder, salt and cinnamon, mix together. Mash the banana in a bowl and add the coconut oil and mash together. Add to the mixing bowl with the soy milk and vanilla and mix in. Your batter will be fairly thick. Heat up a pan with a little coconut oil until hot and then add in some batter for your first pancake, around 1/4 cup of batter at a time. When the pancake starts looking dry along the sides with little bubbles on top, then flip it over until browned on the other side. 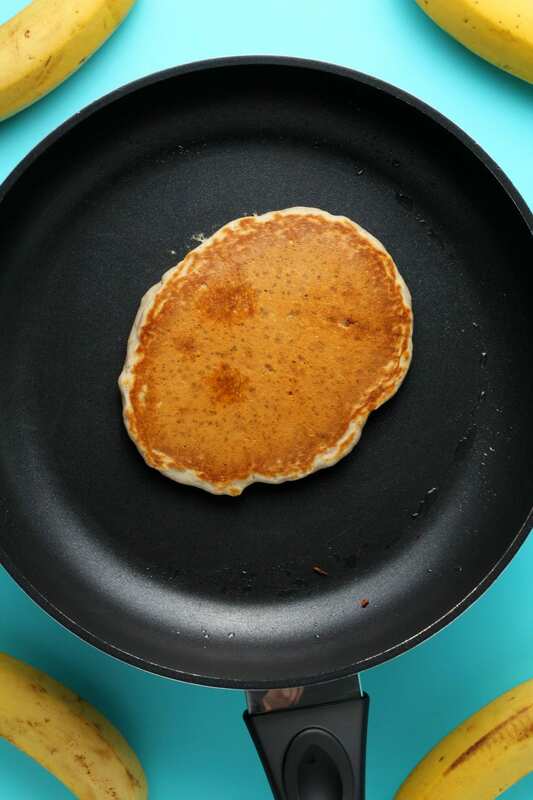 Keep flipping and pushing down with your spatula until the pancakes are very nicely browned and the inside has had a chance to cook through. 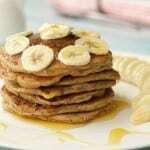 Serve pancakes with some sliced bananas, other fresh fruits as you like and syrup for drizzling. 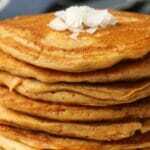 *Nutritional information is for 1 pancake of 8 excluding any toppings. 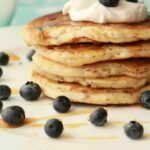 Vegan Pancakes – Light, Fluffy and Perfect! Previous Post: « Vegan Coffee Smoothie – Rich and Creamy! Turned out really well! I used just water instead of soy milk, I find it rarely makes a difference, and indeed you couldn’t tell here! Made this tonight for my baby. I left out the cinnamon and the salt, and I used regular cows milk instead of soy milk. They came out great! They smell and taste great, they are thick and fluffy, and my 8 month old loved them 🙂 thank you!